An animatronic werewolf isn’t in everyone’s budget but that doesn’t mean you can’t do Halloween in style! Halloween is one of those holidays where you can really go to town with fun and funky decorations. It doesn’t have to look sophisticated or classy: it just has to look spooky! It’s always an option to take a trip to the dollar store and load up on decorations but the key to a well put together look, without spending a fortune, is to give it a little thought beforehand. 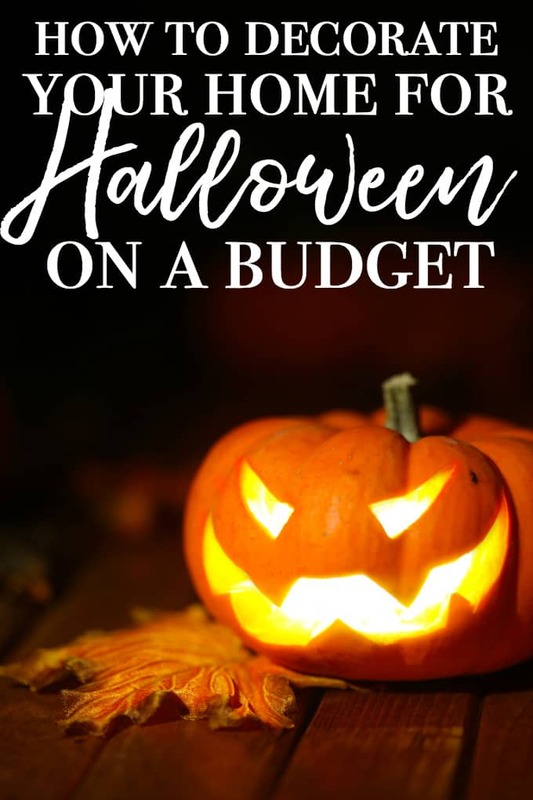 Here are a bunch of ideas that you can mix and match to give your home a little of the Halloween scare it needs! Make a creepy graveyard — cut out some tombstone shapes from cardboard (this is where boxes from your Amazon delivery will come in handy!) and paint them grey, with R.I.P. painted in black! Add some creepy cobwebs and a spider or two and you’re on your way! Fill a few white bags with leaves, draw on a ghost face and place them in amongst the ‘stones’ for extra effect! Need some punny epitaphs? Check these out from DIYNetwork.com—they’re hilarious! Reusable pumpkins for the win — the innards from a pumpkin aren’t everyone’s cup of tea, to say nothing of the mess, so another way to go is to get plastic Jack ‘O Lanterns and some battery operated LED tea lights. Voila! Instant atmosphere that you can reuse year over year! If you want to DIY it, why not get some mason jars, cover them with a layer of orange tissue paper or paint them and draw on your jack ‘o lantern face. Add a tea light and voila: instant pumpkins that you can put in all your windows! Painted pumpkins — if you prefer the real thing (so you can get some yummy seeds out of them) but don’t love the hassle of cutting faces into your pumpkins, you can create some gorgeous decor by spray painting the gourds with metallic, white and black paints and piling them all up near your door. Add a few corn stalks and a small hay bale and you’ll have a good looking Halloween look outside your home. And don’t forget to paint one teal, if you’re offering non-food or allergen safe treats, so kids with allergies know that you’re ready for them! Mummify your front door — wrap your front door with white streamers. Then, make and glue on two huge felt eyes with two rounds pieces of white felt and two smaller round pieces of black felt and voila: mummified door to spook all the ghosts and goblins coming to collect their treats! Make the bushes glow with eyes — if you’ve got bushes around your property, a fun way to freak out the little local ghosts is to get paper towel tubes, cut out creepy eye shapes and then paint the tubes black. Then on Halloween night, all you have to do is put glow sticks inside each tube, and set them into the bushes. Burlap garlands — Some lengths of burlap—gauze also works well for this—make great garlands for your porch columns or rails. Just hot glue on leaves, bats, and other creepy crawlies for an easy to add decoration that is also easy to take down when it’s time to put up the Christmas lights! Creepy silhouettes — cut out cats, bats and creepy shapes from black bristol board or construction paper and then place them in your windows. With the lights on, or with flashlights pointing up behind them, you’ll scare your neighbours for sure! Floating ghosts — white garbage bin liners make the perfect floating ghosts to hang in your tree! Just fill them with leaves that you’ve probably already started raking, tie them off to make a head and make cuts into the rest so that you get a floating body. Then hang a bunch of them from your tree! They look super creepy, floating about in the wind! You can draw eyes and a big round OOOOH mouth on each one with black marker to complete the effect! Creepy wall decor — one fun idea is to get a stick and secure it to the wall and then hang different creepy things like pipe cleaner spiders, bugs, paper bats, cotton batting cobwebs, fake skeleton hands and so on. With a fake crow sitting on top, you can spook people into thinking it’s the real thing! Hanging these over a door frame is even more fun! Pompom spiders — make a lot of these because they’re cute AND spooky! All you need is to hot glue pieces of black yarn as legs onto black pompoms. Add some googly eyes or whatever else you like to bring them to life and you can make a pile of spiders to place all around the house! Egg carton bats — these bats are easy to make and a fun activity for the kids, before the big day! You can hang them all around with a little string or fishing line so that they really look like they’re flying! Sticks in your planters — get some bare sticks and ‘plant’ them in your planters and then add sweeping strings of cobwebs, a rat or crow or two, and some spiders to decorate your porch with. You can take it a step further and spray paint the sticks silver and black to get a really creepy look! Another cute idea is to spray paint some leaves white and draw on a ghost face and hang those on the branches to flutter in the wind! Floating witch hats — this is one where the dollar store can be really handy! Get several black witch hats and some glow sticks, preferably the ones with the hooks on the end. Then you can hang the glow sticks inside the hats with just a loop of thread and string the hats on tree branches or porch ceilings, wherever they’re likely to spook your friends and neighbours best! A spooky wreath for your door — a wreath made of twigs is your best bet for the minimalist, scary look. Add some spiders or bats, cut from black felt and your door is ready! Take it up another level by adding more of the bats all over and around your front door! It will look like a swarm! Like all decorations, more isn’t always better so plan your look and colour scheme to complement your home and give your neighbourhood ghouls a little fright at the same time! We like going to the dollar stores for holiday decorations, or purchasing them at yard sales or out of the clearance bins once the season is over. I love the idea of putting eyes on the front yard bushes! So fun! I’d rather paint pumpkins since they last longer. I like the glowing eyes in the bushes. I love decorating for Halloween!! And I love the ideas about using LED lights inside a pumpkin. I have gotten a lot of nice Halloween decorations at the Dollar Store and have the whole house decorated! Thrift stores also have really good deals on Halloween decorations. I love to pick up deals. I don’t decorate any more. No kids come to our house because we live in a rural area and now my kids are grown. These are really great ideas! With all these ideas, my house will be the best decorated one on the block.